The State Of The Union is pretty apparent. A mother and a congressman's wife are removed from the people's house and one is arrested. 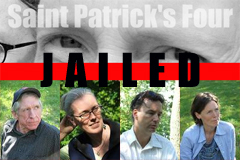 Four peace activists are jailed on misdemeanor charges for an act of non-violent civil disobedience in 2003. After a jury voted 9-3 for acquittal they were later tried in Federal Court. Not since since the late sixties and early seventies has the government resorted to this type of behavior, suppression, and censorship. SPEAK OUT!